The all new Maxxis Ceros is a UTV-specific tire, built to handle the extreme abuse your UTV takes. Radial construction provides better shock absorption, allowing for a smoother ride. The Ceros contains a directional, smooth-rolling tread pattern, providing steering precision and straight-line stability at high speeds. The tread pattern also creates predictable braking due to its aggressive traction for hardpack to intermediate conditions. 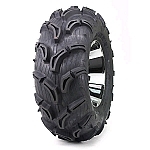 - Maxxis Ceros ATV/UTV Tires are sold individually. 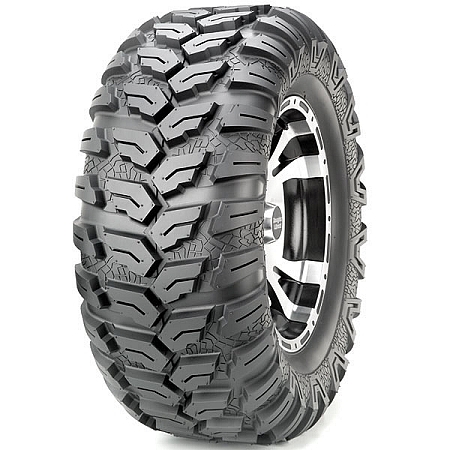 - Our Maxxis Ceros ATV tires generally ship out within 1 business day! - Overall this is a great all terrain tire that will take you anywhere you want to go! I have a 2012 Polaris Ranger 800xp. I was looking for something that would wear good, driving on the highway but kick it in the mud. These tires definitely fit the bill!!! I would recommend these to anyone. We use the Maxxis Ceros on our UTV's for land surveying. We have installed several sets on our units. They are great at providing good traction, durability, and longevity while not leaving behind deep ruts and tracks for minimal disturbance. I bought these for a Japanese mini truck. very few radials available in a size that will fit factory wheels. Installed them with a small lift on the truck and they work great. Good stability and traction with a smooth ride on hard surfaces. And priced well for a radial. Exactly what I was looking for. Spend most of my time working on farm or at sporting clays range. These tires are solid ....good for heavy loads, decent hook-up, doesn't tear up the terrain , smooth riding, excellent handling. Ceros is a winner all around. removed factory maxxis 2.0 on my 2012 john deere gator for quieter tires for pavement roads. still a little noise but not like the factory tires. First I'd like to say how good costumer service is . The tires are amazing . I put them on a Suzuki mini truck they look amazing can't wait to get to try them in snow. Q: These tires (Maxis Ceros) are DD.O.T. RATED? For both sizes 25x8-12 and 25x10-12? It does not say so in the ad. A: No, These are not DOT approved. Q: it this a dot approved tire ? Q: I have a 26 X 12 R12 tire on my Polaris Razor 4. Will any of these tires fit that rim? A: Yes, 26x12-12 is your rear tire size and the 26x11-12 will fit on your rims just fine. And then you would want to run the 26x9-12 on the front. Q: What is the wt. limit on these tires ? A: Each size has it's own weight limit. What sizes are you looking for and I'll get that info for you. Q: the 26x11x12 tire, what is the diameter when inflated??? A: The diameter will be around 25.5 inches. That will vary depending on the rim width. The wider the rim the shorter your tire will be. If you use a narrow rim the tire will be taller. Q: can you get this tire D.O.T approved? A: No, this tire isn't DOT but check out the GBC Kanati Mongrel, STI Chicane, EFX Motohammer, Tensor Regulator. All of those are similar and they are all DOT. Q: i need a couple sets of 26/9/12 26/11/12 of good street tires. do u have a brand that would be good on the pavement? A: Yes we do, These tires actually do very well on the pavement. I would recommend these Maxxis Ceros tires or you might consider the ITP Bajacross tires. Both are offered in the sizes you are looking for and would hold up well for you on pavement. Q: I have a '16 Polaris Sportsman 570 and looking for "turf tires" that won't rip up the grass when hauling and landscaping, etc. Will these work well, or do you have another suggestion? I to not have Turf Mode on this machine. A: I would recommend these tires for what you need. You might also consider the GBC Kanati Mongrel or GBC Afterburn streetforce. Check them out and let us know if you have any other questions. Q: I’m looking for a tire that is “turf friendly” but still sturdy enough to handle gravel/dirt trails and occasional pavement. Would you suggest Mongrel or Ceros? I prefer the 10-ply and DOT rating of he Mongrel. Would it be about as turf friendly as the Ceros? Thanks! A: I would recommend the Mongrel. It's just as turf friendly and it's a 10 ply DOT approved tire. The Mongrels are extremely popular for what you are needing.